Set of 12 school cowbells - choose a color to match your theme. Colors - blue, white, purple, orange, green, red, yellow, black, silver, brown. Use these 3 inch shiny noisemakers on holidays or as party favors. Your parties or sporting events will rock with these metal cowbells. Make some noise with these cowbells to cheer on your school or team. 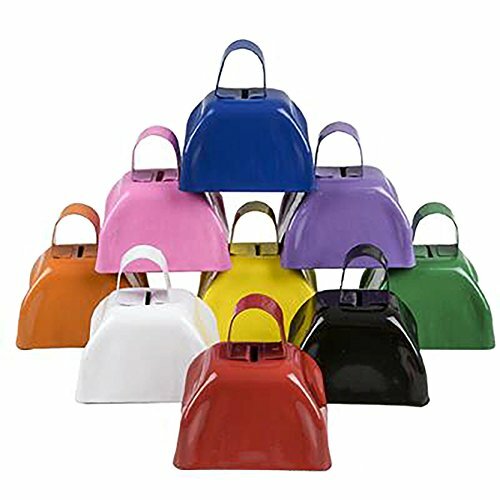 Choose a color to match your theme - set of 12 school cowbells. Each cowbell noisemaker measures approximately 3 inches. Fun party idea - use these shiny noisemakers as party favors. Your parties or sporting events will rock with these metal cowbells. Make some noise with these cowbells to cheer on your school or team. If you have any questions about this product by SNInc., contact us by completing and submitting the form below. If you are looking for a specif part number, please include it with your message.